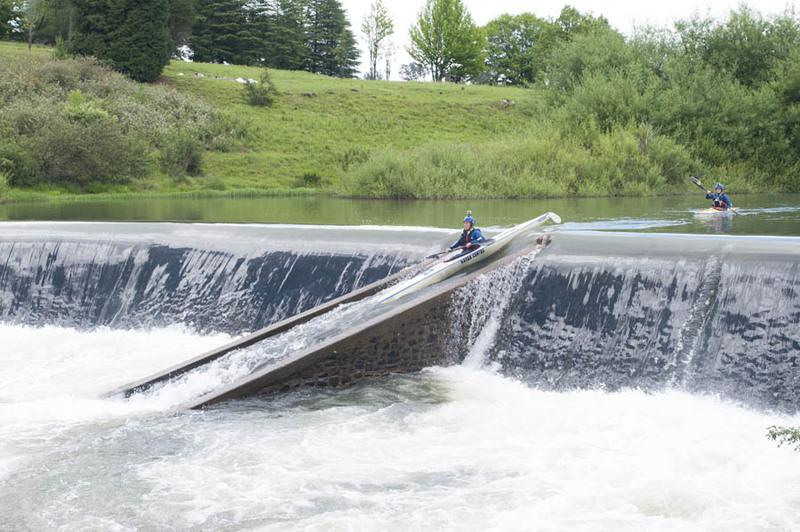 Scotston’s weir comes up a few hundred metres after the Scotston’s bridge in Underberg, and is called The Mineshaft after the fast Fish chute that has been built down the weir and is the only place that this big weir can be shot. Treat this weir with respect. As you pass under Scotston’s bridge, look on the right hand bridge pillar to see the water level readings. If the water is above Level 3 then this weir kicks up some amazing and very powerful boil lines, one of which intrudes on the bottom of the fish chute. At this level the weir must be portaged. The left hand bank portage is easy and recommended, but it is possible to hop over the wall on the right. Anything below level three is shootable down the fish chute. It is a good idea to scout this weir before shooting it as trees and debris can easily get caught at the bottom of the chute after heavy rains. In summer the entry to the fish chute is often marked by two slalom gates that mark the start of the slide. In lower water conditions you can see the top of the chute from above the weir – the right hand wall is slightly higher than the left so if you can see one bump, aim left of it! Look downstream and locate a bush on the right hand bank with a pile of whitewashed rocks in front of it. This is your line from the top of the chute to make sure you head down it on the right line. The wall on either side of the chute is ideal to brace against on the way down. In a K2 the front paddler will go pretty deep under water! There is a simple and fun rapid just below the weir that is shot down the centre.